I deliberately forgot my notebook this year. Just took three weeks off to celebrate 15th Independence Day with the people of Eritrea from May 19 up to May 24, visit friends and the festival of Mariam Dearit in Keren from May 26 up to May 31. To be back in time to celebrate the wedding of my sister in law, Gorzit on June 3 and 4. Best memories of May 19: My visit to Isak T. of the Eritrean National Chamber of Commerce, who got me invitations for the evening ceremonies at Bahti Meskerem Square on May 19 and May 20, and an invitation for the May 24 event in Asmara Stadium, for one of the seats for the honored guests. 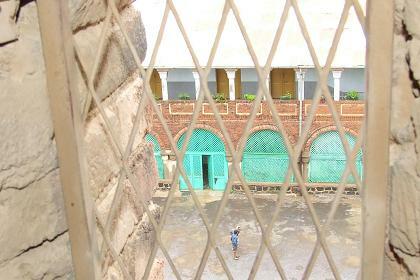 I visited the cathedral, its school and the monastery. I climbed the bell tower. Watched the small exhibition of students art at the Ministry of Education. Followed the advice of Doris Wagner to see the cozy Concord Pension with its beautiful court yard. Confirmed my Eritrean Airlines flight to Amsterdam, got my Foreigners Permit to Travel, Nakfa's, agenda updates, many handshakes and kisses of friends and family. 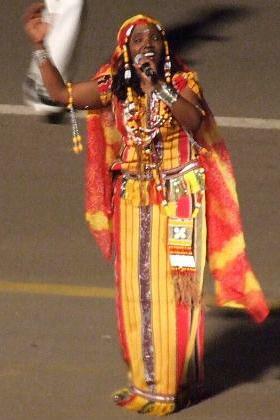 And a show of Eritrean singers, dancers and drama at the Bahti Meskerem Square from 19:00 up to 22:00 in the evening. Touching simplicity, and heart-warming cultural shows. 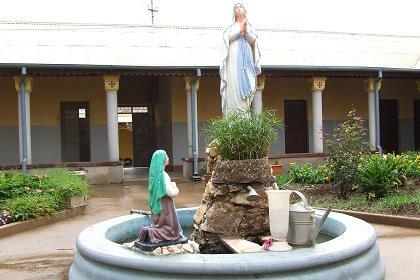 Catholic Cathedral Asmara Eritrea - Monastery garden. Catholic Cathedral Asmara Eritrea - Catholic elementary school. Catholic Cathedral Asmara Eritrea - view from the bell tower. 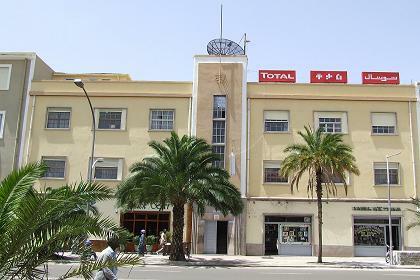 Harnet Avenue Asmara Eritrea - offices, shops and apartments. 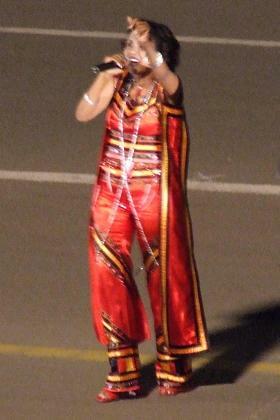 Picture at an exhibiton - Ministry of Education Asmara Eritrea. 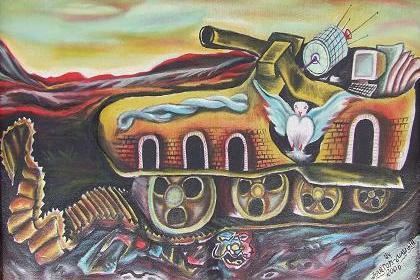 Painted by Habtom Uaizghi (2006). 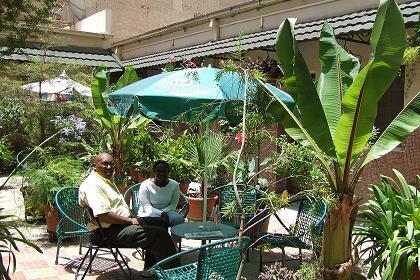 Courtyard of Concord Pension (behind Cinema Impero) - Asmara Eritrea. 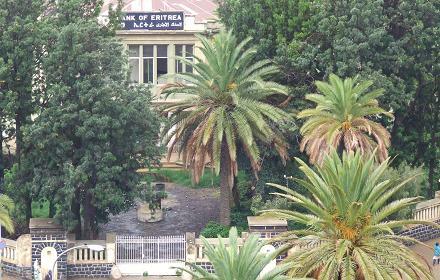 Bahti Meskerem Square Asmara Eritrea. 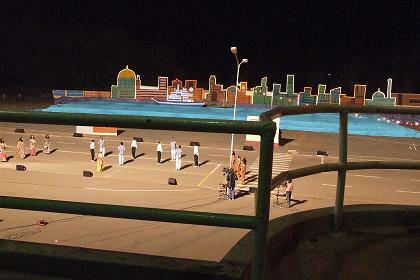 Singers at the evening show - Bahti Meskerem Square Asmara Eritrea.